HELENA, Mont. - Two Montana lawmakers are trying to start a class-action lawsuit against "Three Cups of Tea" author Greg Mortenson, claiming they were duped into buying Mortenson's best-selling book and donating to his charity based on lies they thought were true. The claim filed Thursday in federal court in Missoula is the latest fallout from reports by "60 Minutes" and author Jon Krakauer last month that alleged that Mortenson lied in "Three Cups of Tea" about how he became involved in building schools in Pakistan and Afghanistan. 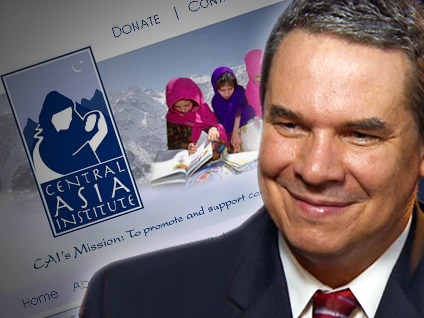 The reports also questioned whether Mortenson financially benefited from his charity, Central Asia Institute, and whether CAI built the number of schools it claimed. The complaint, which tells only one side of a legal argument, alleges Mortenson and CAI induced state Rep. Michele Reinhart of Missoula to buy the book and Rep. Jean Price of Great Falls to donate to the charity. Reinhart and Price claim Mortenson and the charity engaged in fraud, deceit, breach of contract and racketeering under a statute normally used for prosecuting mobsters. The Democratic legislators are seeking class-action status, saying the lawsuit potentially could be joined by millions of people who bought Mortenson's books, heard his speeches or donated to his charity. "They purchased the book because of his heart-wrenching story which he said was true," said Great Falls attorney Alexander Blewett, who is representing Reinhart and Price. "If people had known all of this was fabricated, they would not have given the money." Can Greg Mortenson charity survive scrutiny? Mortenson was in his Bozeman home awaiting word on whether he could safely undergo surgery to repair a hole in his heart, according to a statement by his doctor posted on the Central Asia Institute's website. A spokeswoman for the charity did not return a call for comment on Friday. Mortenson has previously denied any wrongdoing, though he has admitted some of the events in his book were compressed over different periods of time. CAI has pledged full transparency and posted years of financial statements on its website. Reinhart heard Mortenson speak at the University of Montana in 2007 and bought "Three Cups of Tea" in 2009. Price heard a presentation by Mortenson or CAI in Great Falls in 2009 and made a donation "relying on the truthfulness of his statements," according to the complaint. Neither immediately returned calls for comment. Their attorney, Blewett, is the father of another Democratic state lawmaker, Sen. Anders Blewett. The plaintiffs are asking a judge to rule that Mortenson and CAI violated the federal Racketeer Influenced and Corrupt Organizations Act, also known as RICO. They made the RICO claim because Price gave CAI a second donation after receiving a solicitation in the mail, which Alexander Blewett said constitutes mail fraud. The racketeering claim allows the plaintiffs to seek triple the amount Mortenson and CAI have made from book sales, speeches and donations. The complaint asks the judge to place the money into a trust administered by a court-appointed charity that would direct it to schoolchildren in Afghanistan and Pakistan. "Three Cups of Tea" was released in 2006 and sold more than 3 million copies. That notoriety helped Mortenson grow the Central Asia Institute by generating more than $50 million in donations. The fallout from the "60 Minutes" and Krakauer reports prompted Montana Attorney General Steve Bullock to open an inquiry into the charity last month. Blewett said a class-action lawsuit represents the best way for the public to find out the truth because it could result in Mortenson's sworn testimony. "We welcome the opportunity to let Mr. Mortenson testify under oath to all these things. To us, it seems overwhelmingly false and we will give him ample opportunity to explain away all of the falsehoods," Blewett said.